Another day, another shop window with a new slogan. This one just didn't make much sense to me. 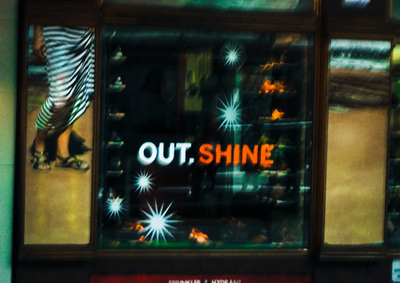 A shoe shop window with summer shoes on the beach and the slogan "Out. Shine". So let's think this through a bit. Out might mean outside perhaps - as we start to get some early warm weather (amongst the snap cold changes which Melbourne is well known for) perhaps it's encouraging us to get outside into the weather. Or at least to begin to think about doing this. With daylight saving starting we also have more daylight hours to get out to the beach or local parks. Or out could also mean getting our feet out of our winter boots and stockings. Time to free our feet from such restrictions and get into some summer sandals and walking shoes. That could be it. So the "out" is starting to make some sense now. The "shine" is proving to be a bit more challenging to me. Perhaps it's tapping into some competitive streak to look good in your shiny new shoes. And to outshine other people, your competitors if you like. Or the shop's competitors. Perhaps it is suggesting that when we have nice new shoes which are comfortable we are able to feel good, get that internal shine glowing. The sparkly images accompanying the words would certainly suggest this kind of glow. So it's curious that this piece of advertising has struck me as so confusing. Perhaps it's because I'm not really a "shoes person". I enjoy shoes that are comfortable and functional rather than having the latest fashions or most expensive brands. Maybe the meaning of this ad would be much clearer to other people who get something else from their shoe purchases. I guess by having me take the time to think about it the advertising has done its job. I wonder if some ads are deliberately unclear to really get us to think, engage and talk with each other. If it's too simple and clear we might just ignore it and that defeats the whole purpose of advertising.